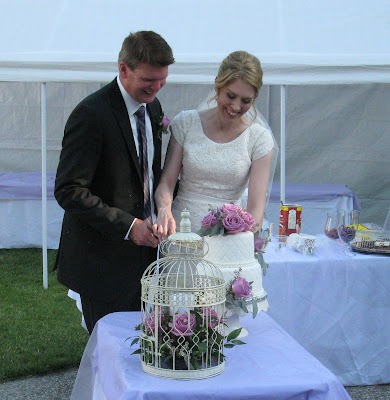 The wedding was outdoors, with a temple sealing to follow at a later date. There was a decorated arch that Gary had built for his daughter's wedding a few months ago. The guests were seated on folding chairs covered with white silk covers, with a center aisle. Evelyn's daughter was the flower girl. Evelyn and Gary were attended by their children. Bishop Steve Hudson officiated and gave a beautiful service. A minor glitch occurred in the ring ceremony. Gary’s ring was too small, but everyone took it in good humor. Soon they signed the register, and marched down the aisle as Mr & Mrs Belter. We had just acquired an addition to our family: a son-in-law and three step grandchildren, and miscellaneous other in-laws Our family had grown! Then the wedding party was off to the park in Stony Plain for more photos. The rest of us visited until they returned and it was time for supper. Gary was now wearing his ring. Judy and I sat with family. The tributes to the bride and groom (by Gary’s children and Evelyn's sister) were very moving. Evelyn and Gary are wonderful people, and greatly loved. It was a lovely supper. Judy and I had chosen chicken, and even looking at the burgers and steaks chosen by others, I felt that it was a perfect meal. After the supper, was the dance. The first dance was by Gary and his mother, and Evelyn and me. It has been so long since a last danced, that I had two left feet. As I remarked to Evelyn, “It is a good thing the photographer is taking still photos, as if he was taking video it would be obvious that I had no idea what I was doing”. Evelyn looked beautiful and happy; Gary looked handsome and happy, a well matched couple. After dancing for a while, the guests started putting things away. With all of the help it went quite quickly. Judy and I arrived home about 9:30, tired but very happy. Best wishes for happiness now and forever! We love you!